We all worry about dehydration. Did you know there are extreme dangers associated with a phenomenon called Hyponatremia? In simple terms this is over hydration and can actually cause death. Generally this is associated with lack of food, and drinking large amounts of fluid during extreme or endurance physical activity. This can cause the body’s salt levels to drop dramatically and cause body cells to swell and leak into the bloodstream. A person can suddenly suddenly collapse. Coma or death are genuine concerns. 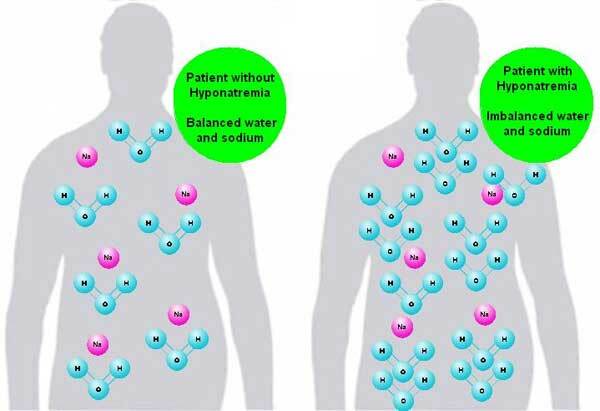 Let it be known that the symptoms of over hydration are similar to dehydration. Hydrating with water only worsens the situation. Simply put the easiest way to tell the difference between hyponatremia and dehydration symptoms is to look for swelling of the fingers, joints, wrists. Also watch for ring and watch tightness due to excessive swelling. In patients with severe hyponatremia (serum sodium <125 mEq/L), central nervous system symptoms predominate and can progress to seizures, coma, or death. Neurological symptoms are generally less common in patients with chronic or mild hyponatremia (serum sodium >125 mEq/L). Some simple tips: Try to snack from time to time before and during the activity. It usually only takes small amounts of salt found in most foods to rebalance your system. Sports drinks work well. Try to prehydrate before exercising then continue to drink appx a cup of fluid every 20 to 30 minutes. Authors note: We possess no personal medical expertise. Our intent is only to briefly inform the reader of a possible dangerous situation. Please speak with a medical professional for more detailed information on this potential life threatening situation. This entry was posted in Year Zero Survival Blog and tagged exercise, fatigue, fluids, health, hiking, hydration, Hyponatremia, outdoors, sports, survival health, symptoms, water by guest-blogger-omegaman. Bookmark the permalink.